From the Facebook algorithm that refuses to let you pick and choose what you want to see in your feed to Gmail’s hidden (desktop) or nonexistent (mobile app) setting for turning off threaded conversations, there is nothing more annoying about technology than having it dictate how you should use it. This attitude at Microsoft has resulted in them continually making it harder and harder to access Control Panel, the traditional interface for customizing your computer’s settings. 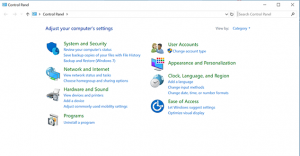 Until recently, you could access Control Panel by right-clicking on the Start menu. However, with the Fall 2017 Creators Update, that menu item has now disappeared. Thanks to T4L reader James who pointed out in the comments on another post that while Control Panel is no longer in the right-click menu, you can still get to it from the Start menu if you scroll down the list of programs to Windows System and click the down arrow to display several options, including CP. However, you still have the issue that when you click on certain links, it takes you to the new Settings windows instead of the classic dialog boxes from earlier versions of Windows. This wouldn’t be such a big problem if the Settings panels that Microsoft wants you to use actually had options for all the settings available in Control Panel. But it doesn’t. While there is a setting that lets you select which programs to open based on a file’s extension, it often doesn’t let you pick the app you want, whereas in Control Panel you can always browse to the program’s .exe file. So this post shows the current ways you can access Control Panel and its various settings. I can’t guarantee how much longer they’ll work as Microsoft seems really intent on phasing out CP altogether, but in the meantime you can try to see if they work for you. This will work for some settings—for example, Keyboard settings. Click on the Start button and start typing the setting you want. If you’re lucky, it will come up in its classic Windows dialog box. Unfortunately, this won’t work for a lot of settings. For example, if you type in Mouse, it will open the new Mouse Settings window, which may or may not have what you’re looking for. In some of these windows, including the Mouse one, there will be a link to Additional Settings that will open the Control Panel version, but it’s not the case for all of them. As mentioned above, you can still access the full Control Panel from the Start menu under Windows Settings. You can also access it by clicking on the Start button and typing, well, Control Panel. While this looks like it will solve all the problems, unfortunately if you click on certain links, like to the Default Programs settings, it will redirect you to the new interface instead of the classic one. And you’re faced with the same limitations again. Once you’ve got Control Panel open, you can enter a term in the Search box to try to find the setting you want. This currently works if you type in Set File Associations, which brings up a link to the old interface. This example shows how to use this method to access the File Associations settings. Click the Start button and type Run to open the Run dialog box. Although the page refers to Windows Vista (! ), the commands still work in Windows 10. You just need to replace “%systemroot%\system32\control.exe” with “control”. I can’t guarantee that all of these still work, but if none of the other methods are working for you, it’s worth checking out. Do you know any other methods for accessing Control panel? Let us know in the Comments below!